1) Sync button: Start sync manually or stop sync while syncing. 2) Sync status bar: Last sync date info. While syncing, display current process in detail.When just finished sync, show last sync result. 3) Edit button: Change the order of folder list or remove user added folder. Adding folder to home can be done by folder action menu. 4) Article count: Recent day’s unread/read count and total count. Recent day interval can be changable by user at ‘unread counting’ item in display setting menu. 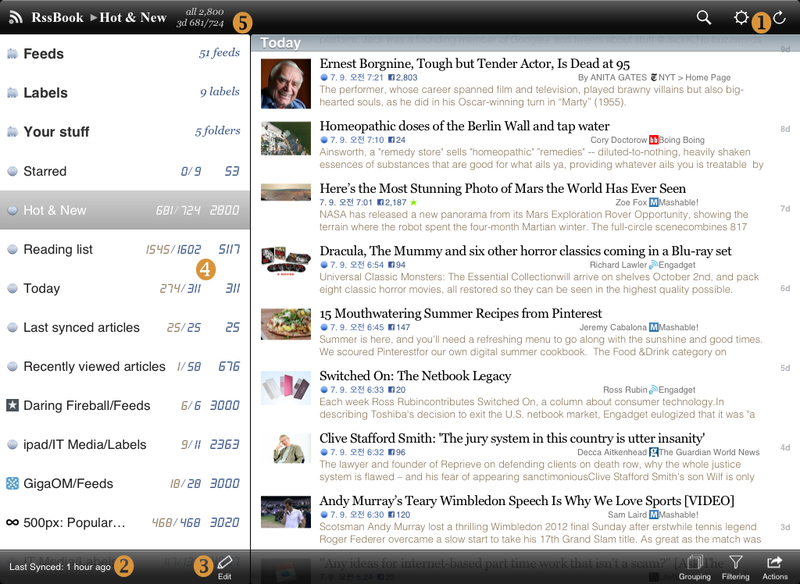 5) Navigation title bar: Display current folder path of right content pane. Tapping on folder title will pop to that folder directly. 1) Grouping button: Available grouping options are by feed, label, google attribute(starred..), tag, author, and date. some options(tag) are recursive. 3) Swipe right: Same effect as back button(going to parent folder). 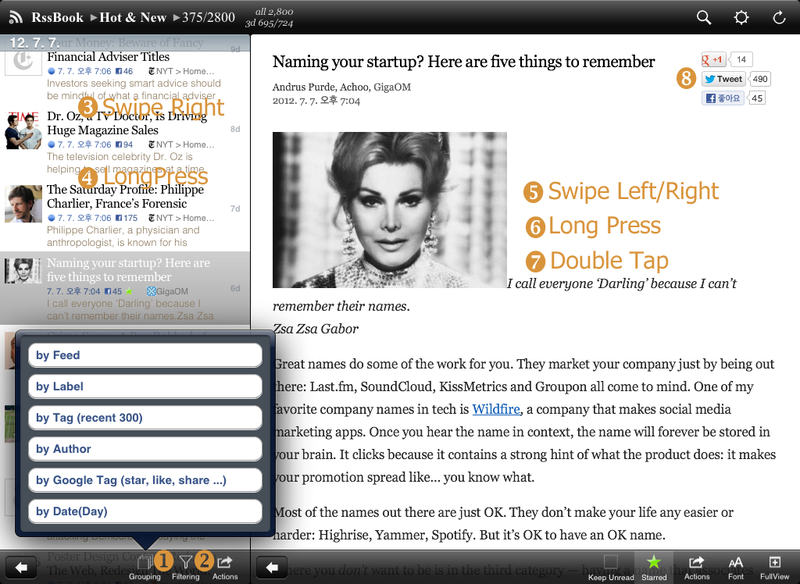 4) Long press cell: When long pressing cell, article action menu will pop up. ‘Mark all as read older than this article’ menu will appear only in this popup. 5) Swiping Left/Right: Go to next/previous article. 6) Long press menu: When long pressing content words, additional menu appear. Wikipedia, Google, Wiktionary and Search in article is provided default. You change the order and visibility of menu at display setting. And two more ‘user defined menu’ are available. With user defined menu, you can add some localized dictionary for your language. 7) Double tap: Wen double tapping on article content, switch between full size view and normal size view(Supported on iOS 5.0 or later). Same effect as ‘FullSize’ button on toolbar. 8) Social bar: You can enable/disable this social bar in social setting menu.